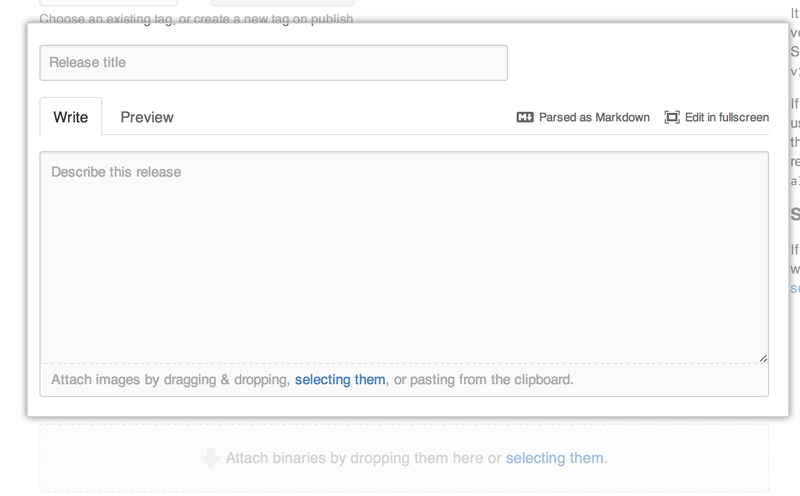 Releases are a great way to ship projects on GitHub to your users. Type a version number for your release. Versions are based on Git tags. We recommend naming tags that fit within semantic versioning. Select a branch that contains the project you want to release. Usually, you'll want to release against your master branch, unless you're releasing beta software. Type a title and description that describes your release. If you'd like to include binary files along with your release, such as compiled programs, drag and drop or select files manually in the binaries box. If the release is unstable, select This is a pre-release to notify users that it's not ready for production. If you're ready to publicize your release, click Publish release. Otherwise, click Save draft to work on it later. If you'd like to automatically create releases (either from the command line or in a script), see "Releases" in the GitHub Developer documentation.